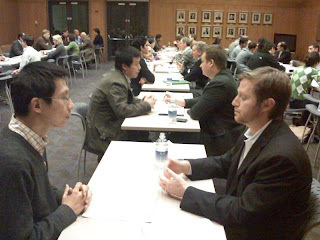 Recent event - this was the CEO Workshop we held here at Fuqua in Faculty Hall on Thursday, February 5th. We had 22 local startup CEOs and about 30 students, and they "speed networked" for 10 minutes each, to talk about startup issues. The CEO Workshop is part of the Duke Entrepreneurship Education Series (www.dukedees.com). The co-organizers are Fuqua's Center for Entrepreneurship and Innovation, the Entrepreneurship and Venture Capital Club, the Duke Start-Up Challenge, and Duke's Center for Entrepreneurship and Research Commercialization. It was a solid event.